Our chorus is made up of a diverse group of women from the Washington, D.C. metro area who share a love of harmonizing and entertaining. We are a membership organization of performers who meet regularly to practice and perform. Chartered in 1976, Potomac Harmony Chorus performs a variety of music, from traditional favorites to the fifties sound to modern jazz, all in four-part harmony, barbershop style. In doing so, we preserve -- and evolve -- a unique American art form. For our members, there's fun to be had, along with opportunities to develop our leadership and performing skills. Under the direction of Master Director Ozzi Mask, the chorus has been honored for its musical excellence five times as regional champions (1990, 1996, 2002, 2004, and 2006) and has always ranked as a top-five medalist at the annual regional competition. Potomac Harmony Chorus is dedicated to presenting high-quality shows for local audiences, and we participate in numerous community activities including the Arlington County Fair, Relay for Life, Light Up Rosslyn, Willard Hotel Holiday Lobbying and Ballston Common Shopping Mall Holiday Celebration. 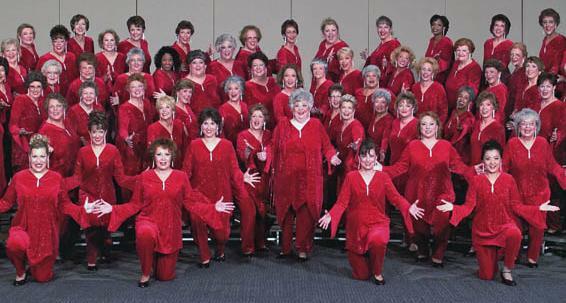 The chorus also presents an Annual Show for the general public and performs at corporate events, residential complexes, hospitals, hospices, senior living facilities and other nonprofit organizations. In addition to performing for local groups, the chorus has been invited to share this traditional art form at special events, such as the Open House for the Kennedy Center for the Performing Arts, the 200th Anniversary Celebration of the Constitution at the National Archives, a celebration honoring local 1996 Olympians, the opening ceremonies of the Cherry Blossom Festival and the National Botanical Gardens. Potomac Harmony Chorus has been featured on "FOXTV5," "Good Morning America" (ABC), "Capitol Edition" (WUSA), and "Arlington Alive" (Arlington Cable Television). We have also performed in shows along with men's choruses including the Historyland Barbershop Chorus in Fredericksburg, Virginia, and the Alexandria Harmonizers in Alexandria, Virginia. The full chorus or small groups (of various sizes) are available to sing at your next function or event. If you're looking for a unique musical experience to liven up your event, please view our Hire Us section. In addition to sharing our music with others, another great passion of ours is learning more about the art of a cappella singing. Vocal instruction is a regular part of chorus rehearsals and a very important component of the chorus experience. 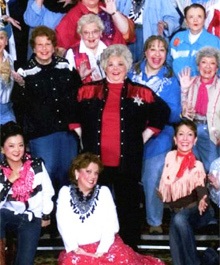 Potomac Harmony Chorus is a chapter of Sweet Adelines, International (SAI), a non-profit musical education and performance organization of approximately 30,000 members. We belong to SAI's Blue Ridge Region #14. CompetitionIn the spring of every year, Potomac Harmony Chorus participates in the Sweet Adeline International Blue Ridge Region #14 chorus competition. Competitions are a special time for quartets and choruses from our region to come together to sing for each other and get some constructive feedback from a panel of judges. The winners of the regional competition in both quartet and chorus categories get to travel to International Competition, which is held in the fall in a city selected each year. Potomac Harmony Chorus is currently the home to a number of wonderful quartets - four individual voices singing in the same barbershop style. Click here to see our quartet section to learn more about them. Potomac Harmony is supported in part by the Arlington Cultural Affairs Division of Arlington Economic Development and the Arlington Commission for the Arts, www.ArlingtonArts.org.